Kitesurfing – what is it that is happening? Why is the kite pulling? The reason to why we can kitesurf is due to this invisble force that pulls the kite upwards/forward. How is this force created? As the wind hits the kite, the air flow is being separated so that some air passes above the kite’s canopy (extrados) and some air passes below the kite’s canopy (intrados). Hence the two air currents that passes the kite take on path each. Due to the shape of the kite the speed of the upper air flow will be a big faster than the lower air flow. 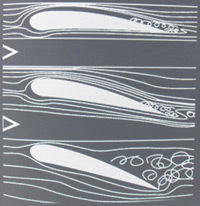 The air flow that passes under the kite, on the intrados side, will be slowed down which in turn increases the pressure. The comprehended pressure on the lower side will push the intrados away from it. The opposite happens on the upper side. Here the accelerating air speed creates a bigger space between the air atoms which reduced the pressure. In turn, this creates a suction force that pulls the extrados towards it. The two forces on the intrados and extrados work together to create the aerodynamical force exerted on the kite. Since the position of the kite always is perpendicular to the kite lines then the kite will pull against the lines. If the kite is positioned straight ahead of you in zenith then it will pull you upwards in a vertical direction. If the kite is positioned at the surface then it will pull you forward in a horizonal direction. In order to fly the kite must have a streamlined wing profile and it must be flewn in an effective angle between 15° to 25°. As the wind speed (S) increases over a profile, then the pressure (P) is reduced,(S+ = P-). The negative pressure exerted on the extrados makes the kite being sucked upwards. As the wind speed is reduced under a profile (S-), then the pressure increases (P+) which in turn pushes on the intrados. The force that push the kite upwards makes up about 25% of the total force exerted on the kite. The upwards suction force makes up 75% of the total force. Just like an airplane wing, a kite flies mainly thanks to the reduced pressure on its upper side. The generated force depends on the angle between the kite and the wind. 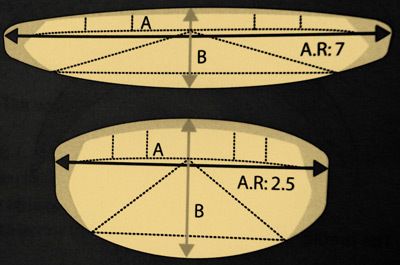 The image below shows how the air flow is depending on the angle between the kite and the wind (angle of attack). The bigger angle, the more turbulence. “The cord” The cord is the dotted line that goes through the centre of the profile. 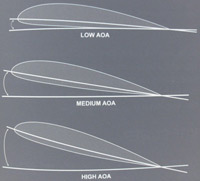 This lines determines the Angle Of Attack (AOA) and the width of the profile. 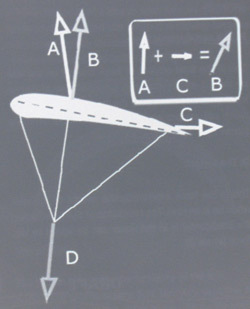 The lift is the force generated by the air that passes through the kite’s profile (arrow A). The drag is the sum of force created through friction between the kite and the air är kraften and by the turbulence that ccurs at the trailing edge of the kite. This force pulls in the same direction as it is being hit by the wind (arrow C). 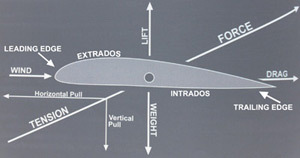 This is the sum of the forces that is created by the lift and the drag (arrow B). Kite manufacturers strive to reduce the drag as far as possible since the drag counteracts the lift. 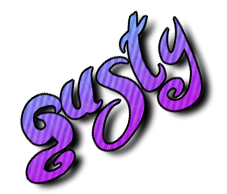 A kite with a high lift force and a low drag is being characterised as a kite with good upwind performance, hence the ability to fly high upwind close to edge of the wind window. This is the force that your apply yourself by your weight exerted on the kite as you stand on the grond (arrow D). When you’re in the water then you also add the force you get from the resistance added by the board. Did you ever launch a kite on land only to discover that you barely could keep your feet on the ground? But things got much easier as you managed to get into the water and got your feet on the board. The extra force you got from edging the board in the water made it possible to conteract the aerodynamical force. This is the angle between the cord and the wind. The force in the kite is affected by the angle of attack. This angle is changed by sheeting in the control bar or by adjusting it for more power or depower. Another method to change the angle of attack is by flying the kite up and down in the wind window. A small angle gives a profile that generates enough force to keep the kite hovering in the air. A bigger angle gives the kite more power, but a wider angle also gives a stronger drag and the kite will be pulled backwards if the drag gets too strong. The image below illustrates an example. 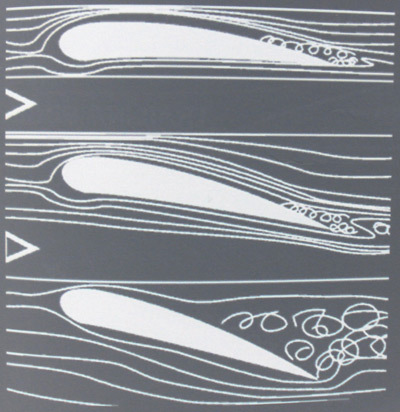 The forces in the kite vary depending on the shape of the profile, the angle of attack and its type (foil or tube). Size matters as we’re talking about kites. The size of a kite is determined by the area of the canopy and is measured in square meters. The size of the kite tells us which potential force it can deliver. There are however other factors that affect the force in a kite such as its shape, profile, aspect ratio, etc. Though the size is the main indicator that tells its power. A bigger kite can deliver more power than a smaller kite. For instance a 6m kite of the exact same contruction as a 12m kite will generate half as much power. The canopy shape is the arched form a kite has when it’s seen from a straight forward direction. This arc gives stability to the kite as it flies through the air since the arched canopy will make the air flow through a tunnel. A completely flat kite must have stabilizers in its wing tips in order to fly stable. The profile affects the properties in a kite. A very flat profile gives a faster turning kite yet it will be sensitive to gusty wind and to changes in the angle of attack. The opposite is a more arched profile which makes the kite more forgiving and which makes it feel soft and easy to handle with the control bar. A drawback with an arched profile is that this kind of profile also creates more drag which makes the kite slower. 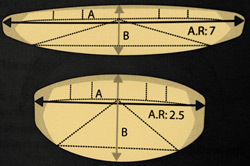 The proportions between the kite’s area/size and its length (from wingtip to wingtip) is called aspect ratio. A kite with a high aspect ratio flies faster, can go higher upwind and gives you a longer hang time when jumping. Kites that have a low aspect ratio are easier to fly, easier to water relaunch and more stable in gusty conditions. As a beginner it can be wise to get a kite that has a low aspect ratio since the kite will be more forgiving and easier to progess with. The relative wind is the sum of the wind speed plus and the induced wind speed. An example of when we create induced wind is when we are riding a bike or when we stick out a hand through the window when driving a car on the highway. If you ride a bike in a speed of 5 m/s and at the same time have a head-wind of 5 m/s then the relative wind is 10 m/s. Stick out the hand of a window when driving on a highway and it feel as if it’s blowing like 40 m/s. It is the force (F) in the kite that creates the traction that pulls us forward. This force is especially noticeable as we fly the kite in the middle of the wind window, when we steer the kite upwards to jump or when we ride with high speed. Sometimes the wind is to weak to generate enough traction force for us to get up riding with a planed board. Then it can help to fly the kite up and down in the wind window. By doing this then we create extra induced wind which in turn increases the relative wind speed. A kite will not pull much as long as it is positioned at the edge of the wind window (above your head or at the far end of the sides). But as soon as the kite get some speed, either by steering it through the powerzone and/or by riding fast on the water, then its force will increase significantly. The kite will give a steady pull when both you and the kite are at a fixed position and when the wind speed is constant. The force will change if you move yourself or if you steer the kite to another position. Both you and the kite are usually in motion as your are kitesurfing, hence the force is more or less changing constantly.